Material (geologic): Late Jurassic (Late Kimmeridgian: lower part of the so-called "Tabalcon limestones"?) flint. Mode of occurrence: Medium-sized (5x5x3 cm to 10x10x5 cm) nodules, either globular or more generally flat and elongated. 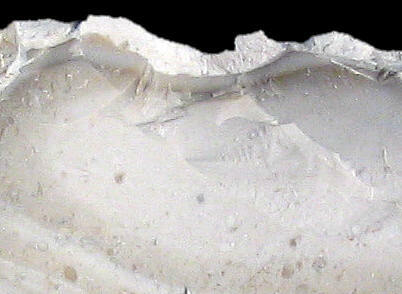 Cortex: White, chalky with a powdery texture, thin (1 to 3 mm), transition sharp. Pattern: Banded, more distinctly so just below the cortex, but given the size of the nodules all detached flakes display banding. Appearance: Outer portion homogeneous, centre imperfectly silicified, but occasionally the entire material may be homogeneous; dull and opaque, smooth and fine-grained (coarse in imperfectly silicified areas). Structure: Grain density is variable, a feature not correlated with colour-banding; convoluted bioturbation figures. Matrix: Opaque, to subtranslucent below the cortex in darker areas. Grains: 1 to 10 %, reaching 30 % in coarser areas, subangular and irregularly shaped, poorly sorted (125 to 2000 µ). Grain composition: Foraminifera (probably Conicospirillina sp. ), very numerous Dasycladaceae algae (Campbelliella striata), abundant sponge spicules (thick-walled monaxon spicules, occasionally preserved tightly-woven lattice of hexactinellids), pelecypod fragments, serpulids, rare Tubiphytes. Co-ordinate precision: As indicated above, this small site has to be protected from heavy exploitation. The coordinates above are accurate enough to get an idea where this material occurs, but deliberately too inaccurate to find the site on a map or with a GPS-receiver. Geology: According to the geological map, the substrate belongs to the Late Kimmeridgian Tabalcon formation (unit J7-8). Map of all sampled localities of Kimmeridgian flint in the Bugey (PDF, 427 KB, opens in new window). 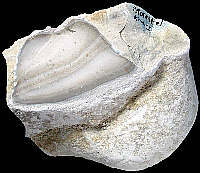 Other types of flint: Apart from the Km1 type, also both other known Kimmeridgian materials, Km2 and Km3, can be found here.